Have a teen or tween that wants to add some personality to their room? Give them the glitzy glitter stack and then step back while the magic happens! 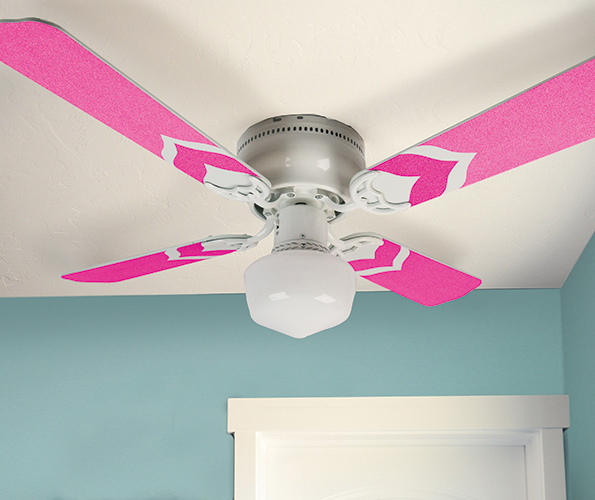 Detach the blades from the fan. Trace each fan blade onto the back of desired glitzy paper. Cut the fan blade shape. Use the template to cut the chevron shape from the cut fan blade shape. Adhere the fan blade shape to the end of the fan blade. Leaving a space on the fan blade after the paper, adhere the chevron s hape towards the center of the blade. Reattach the fan blades to the fan. Use this to spice up the décor in minutes...for almost nothing! When attaching the chevron section to the blades, be sure to line them up each time so that the spacing of the chevron is consistent on each one. Don’t feel limited to using just the glitzy brights paper for this project—there are also glitzy neutrals, various colors of cardstock with foil embellishments, and several solid cardstock selections.